The Soaker Bed Pad with Wings surface is soft and comfortable on your skin, while protecting from wetness. And, it is complete with large, fabric wings to help secure the pad in place. 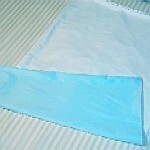 And because it is reusable, it is far more economical than disposable bed pads used for incontinence. This is a specially designed, reusable, and washable underpad that ensures the patient and the bed are protected. 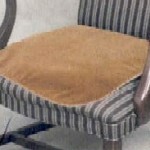 The bed pad is 36 inches by 32 inches with three layers of protection. The 19 inch long wings attached to either side of the bed pad are long enough to tuck under one side of a bed or both (if twin or hospital type bed.) The wings tuck under the mattress and prevent the pad from slipping or moving. 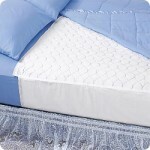 The top layer of the bed pad is made from an 80/20 cotton/polyester blend called IBEX. 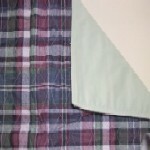 This top layer is quilted to a top quality, 8 oz poly soaker which holds the moisture. The third, and bottom layer, is the moisture proof layer; it is made from a knitted, vinyl, barrier fabric. The bed pad is finished with double bound edges for a long life of many washings. The Soaker Bed Pad will hold up to 60 ounces of liquid. Our staff personally tested this product with water and found that it did indeed hold 60 fluid ounces and then some.